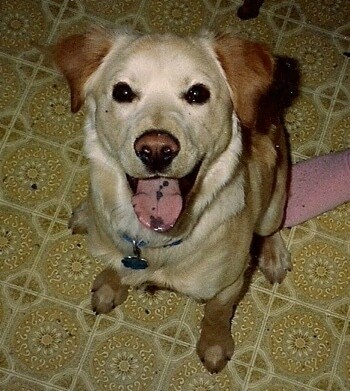 "This is a picture of my dog Sam, who has since died at about 16 years old. This picture was taken when he was about 7 or 8 months old. His mother was a Dalmatian and his father a Golden Retriever. He was one of the sweetest, gentlest dogs ever. He really loved to run, his absolute favorite thing to do! He was scared to death of fireworks and hid under a bed shaking whenever the 4th rolled around. His coat was yellow with a few lighter yellow spots on his head (hard to see). The most adorable thing was that he got his spots on his tongue! As he grew older he gained a few more spots on his tongue as well. Every time after his bath, he would run back and forth across the living room with his ear to the ground (carpet) and try to dry himself off. He scratched the door when he wanted out and then when he wanted back in. He could sit, lie down, and shake on command." The Goldmation is not a purebred dog. It is a cross between the Golden Retriever and the Dalmatian. The best way to determine the temperament of a mixed breed is to look up all breeds in the cross and know you can get any combination of any of the characteristics found in either breed. Not all of these designer hybrid dogs being bred are 50% purebred to 50% purebred. It is very common for breeders to breed multi-generation crosses. Litter of Goldmation puppies at about 1 1/2 months old—the mother is a purebred Dalmatian registered with the ACA and the father is a purebred Golden Retriever registered with the AKC.